The following illustrated proof for the Tough Sudoku of August 7, 2008 employs a very small group of Sudoku techniques, tips and tricks: Hidden Pairs, Locked Candidates, and a Uniqueness deduction. Definitions: Most terms used on this page have a defintion somewhere on the defintions page - although an update is long overdue. Many steps not illustrated are possible. Only one combination step, besides hidden singles, is shown. This one step is sufficient to solve this puzzle, if one assumes that there exists only one solution to the puzzle. Previously, I had abandoned using the chessboard algebraic notation in favor of the more common rc notation. However, since many people have begun again to post proofs on the tough pages, I have returned to algebraic notation. For those unfamiliar with this notational style, grid coordinates are posted with the pictures. Four Unique Possibilities are available here. usually, I search for both hidden pairs and easy single candidate eliminations at this time. This process is easier for me to accomplish without using the possibility matrix. During this search, I found an interesting situation involving candidates 2 & 5. The given, solved, and potential locations of candidate 5 are highlit. This, by itself, is not very remarkable. Usually, I would merely mentally note the potential for a hidden pair at df5 and e19. Of the steps above, step 3 is not required. I view the other 3 steps as one, as the recognition of both (25) limited to def9, and the recognition of both (25) limited to df5, and the recognition of (5) limited to def1 is required for step 4, but also sufficient for steps 1 & 2. (hidden pair 25) at 2 choose 3 of def9 => 25 is independent in row 9, box e8, and those 2 cells. (hp25) at 2 choose 3 of def5 (in this case exactly df5) => 25 is independent in row 5, box e5, and those 2 cells. (hp25) at 2 choose 3 of def1 =>25 is independent in row 1, box e2, and those 2 cells. 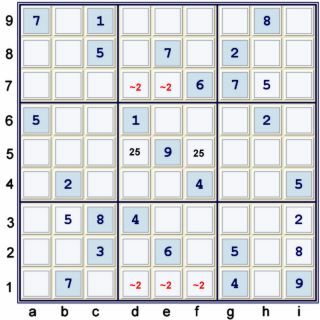 After making the indicated eliminations, one can solve the puzzle using only hidden singles.